Gladys' story needs to be told because she epitomised life of old Laindon. She has passed away now but I for one will never forget this chirpy little lady. I was privileged to have known her in the later stages of her life when she recounted many of her memories to me. She was in constant contact with the outside world even though her sight was quite badly impaired but it did not stop her from making everyone know she was still around. I was going to write about her but decided to contact her relatives and from this, they have come together and have paid the following tributes to her by telling some of her own old Laindon stories. I know she would have loved this. Special thanks to Jill Cox - Gladys' niece, who has gathered information and photos from her family. Gladys Turbard was a well-known figure walking and cycling the streets of Laindon throughout her 36 years of service with The Post Office. During her working life she was apparently one of only 4 post ladies working among 200 men, and at the time of her retirement in 1977 she was reported to be "Basildon's only postwoman". 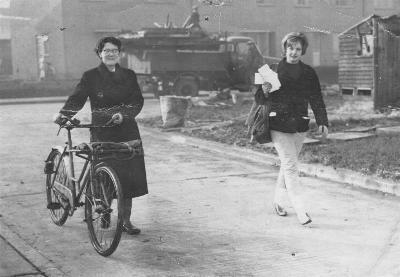 Gladys on her round during the early days of Basildon new town. Gladys was an animal lover and, despite what you hear about postmen/women being bitten by dogs, she claimed that throughout those years on her rounds she had never had a dog bite! Her secret apparently was that she always carried a bag of dog biscuits with her to bribe the more vicious dogs she met. Laindon was a very different place then with the sorting office being the postmaster's parlour and the Post Office itself was the front room of his house. 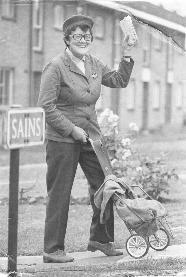 A quote from Gladys in a newspaper article in 1977 said, "I used to walk miles delivering letters and Laindon was all fields and farms in those days. Sometimes I'd have to walk about a mile or more across fields to deliver one letter. While the men were away at war the wives and sweethearts would be waiting at the gate every morning for letters." The muddy, unmade roads, with duck boards to walk on and carrying torches in the dark as there were no street lamps. Coal being delivered by horse and sledge because the roads were so bad. Tom's buses that would pick you up and drop you off exactly where you wanted. And her brothers walking to Laindon Station through the mud in their wellies, leaving them in the hedge and changing into shoes to go on the train...and the wellies would still be there, in the hedge, on their return. The local newspaper covered the story when Gladys announced her retirement after 36 years of service in 1977. At the time of her retirement Gladys was working from Basildon sorting office having transferred there from the former High Road office at Laindon where she had worked since its opening in the early 1950s. It is believed her earliest years were spent working from the first Laindon Post Office when it was run by E.C. Andrews, which from the early 1900s or late 1800s had occupied a plot in the High Road on the north side of Denbigh Road next to T.E. Collins' hardware shop. To the rear of the main shop was a sorting office accessed from Denbigh Road. Gladys was born in Chelsea, London in 1917, where her father was a milkman. The family used to come to Laindon for holidays, probably using the steam trains on the Fenchurch Street line. Gladys was one of 8 children and when she was about 4 years old the family moved to Laindon. For many years the family lived in Northumberland Avenue (alongside the railway line) in Laindon in a large house named Fairfield, but as Basildon New Town grew, Fairfield was in the path of the bulldozers and eventually it was time to move. 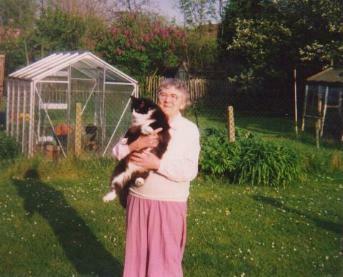 By this time Gladys and her father were the only ones still living at the house, along with 17 cats! They had to move from Northumberland Avenue to a bungalow in Samuel Road, Langdon Hills. She had a great love for cats and although she was unable to take so many with her, she continued to love and care for a succession of cats, some of them from a rescue centre, for the remainder of her life. 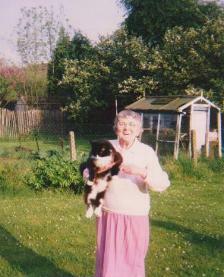 Gladys at home with one of her cats. In her latter years, Gladys was an avid listener to the local radio stations, initially Breeze and then BBC Essex. She was a regular contributor, phoning to speak to the presenters and taking part in competitions. In August 2001, at the age of 84, she was the guest on BBC Essex's "Tea at Three" programme with Steve Scruton. Steve had met Gladys at an outside broadcast in the Eastgate Centre, Basildon and invited her onto his show. During the interview she spoke about many of her memories of growing up in Laindon. She continued to be in regular contact with some of the presenters at BBC Essex and was affectionately known by them as "The Queen of Laindon". Gladys loved music and played the piano in her younger days. She also loved to listen to music and this became all the more important to her in her later years as her eyesight deteriorated. One of her favourite artists was the Irish singer Rose-Marie. Gladys booked her seat in the front row at the Brentwood Centre or the Cliffs Pavillion, Westcliff, whenever Rose Marie was in concert. She became personally known to Rose-Marie, including exchanging Christmas cards and corresponding with Rose-Marie's parents. Rose-Marie would always look out for Gladys at her concerts and present her with a rose. 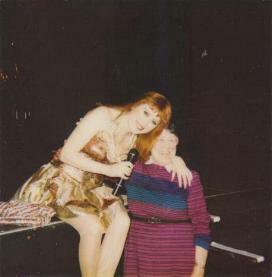 On at least one occasion Gladys was invited up on stage with Rose-Marie. When Gladys passed away and the news reached Rose-Marie, Gladys would have been thrilled to know that Rose-Marie contacted the family expressing her sadness and condolences. 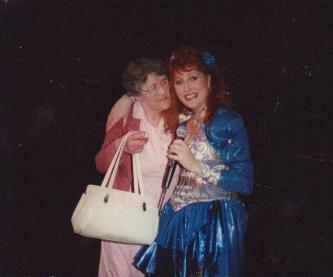 Gladys on stage with popular Irish singer Rose-Marie. Gladys was quite a character throughout her life and lived to the age of 89 years. Title: Gladys Turbard - The Queen of Laindon by Jill Cox. Source: Jill Cox. Copyright © Jill Cox, June 2011. Comments: This account was supplied by Andrea Ash for use on the Basildon History website.